I should apologise for the long gap in items, but I don't feel too guilty about it, because life's rich pattern has been a bit too rich: with a wonderful wedding (congrats, Emma & Pete! ), a significant health issue in the family and planning for serious surgery for that, the death of my wonderful and loving Aunt Patsy, and the birth of a new nephew (welcome to the world, Malachi). Family comes first, but my writing does come second, so that meant that pretty much everything else got squeezed out of the picture. Executive summary: I've been very busy and productive, and I will be holding a series launch of the 1st two books, at Gleebooks on Sat 9th July 2016, 3:30pm for 4pm at Glebe, Sydney. 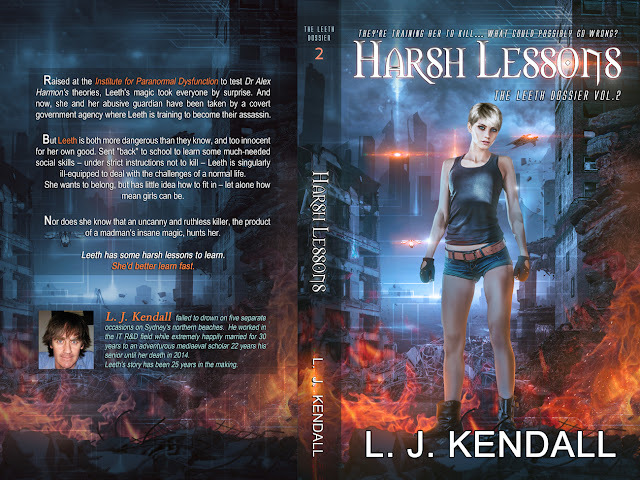 Harsh Lessons (Vol 2 of The Leeth Dossier) should just be ready in time! This is probably a good place to show the beautiful new cover, once again designed by the wonderful Mirella de Santana (https://www.facebook.com/mirellasantana.digitalartist and at http://mirellasantana.deviantart.com/). So this is just a little filler piece before my next planned serious post, about preparing a print edition. I had drafted an article on that topic when I was preparing the print edition for Wild Thing (Vol 1 in the series), but simply didn't have the time to finish the article off and post it here. But since I'll be preparing Harsh Lessons (Vol2) in a week or two from now (epub and print), I thought it made sense to use that to freshen up my experience and finish off the article. In the meantime, this article, which is just a "what I'm up to right now" article. So, after all that "oomph analysis" stuff in the previous post, how did Book 2 fare under Dave's (http://ThEditors.com/) critical view? The big worry was that the book was looking much too long, at I think 165k words – I think it was around 560 pages. And Dave said it sounded like I'd need to cut it by twenty to thirty percent. So, what happened? Well, Dave liked the new stuff, especially the "Mean Girls" story arc. The idea behind that was to fix a small pacing problem, except it in itself turned into 50 pages. But he pointed out that the readers would probably be wanting Leeth to be developing and learning a bit faster than I had planned; and more importantly, he thought I'd taken the easy way out in an area related to that, which meant I'd missed a great opportunity for something quite compelling which would make a natural and satisfying climax if the book ended there. Which just happened to be around the mid-point. His second big suggestion was related to Leeth's fighting prowess compared to her sensei. We ended up compromising, there. So, it was back to the plotting and writing, and I outlined how it would look, and discussed it with Dave, and then got stuck in. Ah, yes, so if you're just wondering "But didn't you also split the 1st book in two? ", then I'd have to sheepishly confess that I had. And indeed, that was the 1st half of the initial MS, which I myself had split in half back in around 2000, I think. Anyway, the split meant that I needed a new title, since Shadow Hunt fits the 2nd half very well (now, Book 3); but doesn't fit the 1st half (now, Book 2). So after much mulling and thinking, I realised Harsh Lessons was the right title for volume 2. Which of course means I'll need to revise the text at the end of Book 1, to update the mention of Book 2's title, and I've also since then (thanks to Dave's critique) tightened the sample chapter I included. The other thing I've been squeezing in, is organising a series launch. Since there was no way I was going to be able to meet my promised publication schedule for Book 2 if I took the time to arrange the launch for Book 1, it made sense instead to delay till July and launch the series, with both books. This is tight: Harsh Lessons has been with Dave for about a week now, and I'll be getting some feedback next week; so depending on how much he thinks needs to be done to it, I may have an impossible amount of work to do, or something achievable, for the July 9th launch! The series launch. So the launch will be held at 3:30pm for 4pm, at Gleebooks, Glebe, in Sydney, Saturday 9th July: the week after the Australian Federal Election. And I'll update this blog post with the RSVP etc. information for the Gleebooks newsletter and website. For the book launch, if you would like to come, it's important to RSVP to Gleebooks directly, using any of the mechanisms they provide: by emailing or by phone (calling (02) 9660 2333), or by going to the Gleebooks website (or is it the newsletter part of the site for July - now in preparation - at The Gleebooks Gleaner newsletter ? ), and RSVP-ing by filling out the form that will be there. As Gleebooks are catering (and I'm paying, of course), we need to have a good estimate of how many people will be coming for both the catering side and so I can guess how many copies to bring along, in case anyone wants to buy one. They'll be available for $20, and I'll obviously be happy to sign them for people. Sandra Wigzell of Book Expo Australia has kindly agreed to be the special guest star. Sandra noticed a few years ago that Australia had not had a Book Expo since the 1970s, believe it or not. So she has been organising and holding them for the last few years, and it seems to be growing nicely. Sandra is a big supporter of indie publishers, book reviewers (including "booktubers" – a lively bunch of people who review books and all related stuff in videos they make), the people who provide services to authors and indie publishers, and of course book lovers. It's a great place for talks and seminars, as well as a chance to meet and talk to authors and everyone else in the book creation world. This year's is on 8/9 October, at Rosehill Racecourse Pavilion. "Book Expo Australia is a dedicated event national and international publishers and authors to meet and interact with avid booklovers"
Love the new title and the cover. It fits the follow on from Book 1. It all looks pretty exciting. Thanks, Barbara, it kind of is, but damped down by a rotten cold and me adding 2~3 days of unrelated work I didn't need because I wasn't smart enough to say to someone "Come back to me after July 9th". Hopefully I've learned a valuable life lesson from that!